The IM3I project addresses the needs of a new generation of media and communication industry that has to confront itself not only with changing technologies, but also with the radical change in media consumption behaviour. IM3I will enable new ways of accessing and presenting media content to users, and new ways for users to interact with services, offering a natural and transparent way to deal with the complexities of interaction, while hiding them from the user. With the explosion in the volume of digital content being generated, there is a pressing need for highly customisable interfaces tailored according to both user profiles and specific types of search. IM3I aims to provide the creative media sector with new ways of searching, summarising and visualising large multimedia archives. IM3I will provide a service-oriented architecture that allow multiple viewpoints upon multimedia data that are available in a repository, and provide better ways to interact and share rich media. This paves the way for a multimedia information management platform which is more flexible, adaptable and customisable than current repository software. This in turn enables new opportunities for content owners to exploit their digital assets. The IM3I project addresses the needs of a new generation of media and communication industry that has to confront itself not only with changing technologies, but also with the radical change in media consumption behaviour. IM3I will enable new ways of accessing and presenting media content to users, and new ways for users to interact with services, offering a natural and transparent way to deal with the complexities of interaction, while hiding them from the user. But most of all, designed according to a SOA paradigm, IM3I will also define an enabling technology capable of integrating into existing networks, which will support organisations and users in developing their content related services. This entry was posted in Automatic video annotation, Projects, Research projects and tagged information architecture, infovis, multimedia interfaces, ontologies, RIA, semantic, SOA, user experience on May 19, 2010 by admin. The VidiVideo project takes on the challenge of creating a substantially enhanced semantic access to video, implemented in a search engine. The outcome of the project is an audio-visual search engine, composed of two parts: an automatic annotation part, that runs off-line, where detectors for more than 1000 semantic concepts are collected in a thesaurus to process and automatically annotate the video and an interactive part that provides a video search engine for both technical and non-technical users. Video plays a key role in the news, cultural heritage documentaries and surveillance, and it is a natural form of communication for the Internet and mobile devices. The massive increase in digital audio-visual information poses high demands on advanced storage and search engines for consumers and professional archives. Video search engines are the product of progress in many technologies: visual and audio analysis, machine learning techniques, as well as visualization and interaction. At present the state-of-the-art systems are able to annotate automatically only a limited set of semantic concepts, and the retrieval is allowed using only a keyword-based approach based on a lexicon. The VidiVideo project takes on the challenge of creating a substantially enhanced semantic access to video, implemented in a search engine. The outcome of the project is an audio-visual search engine, composed of two parts: a automatic annotation part, that runs off-line, where detectors for more than 1000 semantic concepts are collected in a thesaurus to process and automatically annotate the video and an interactive part that provides a video search engine for both technical and non-technical users. The automatic annotation part of the system performs audio and video segmentation, speech recognition, speaker clustering and semantic concept detection. The VidiVideo system has achieved the highest performance in the most important object and concept recognition international contests (PASCAL VOC and TRECVID). 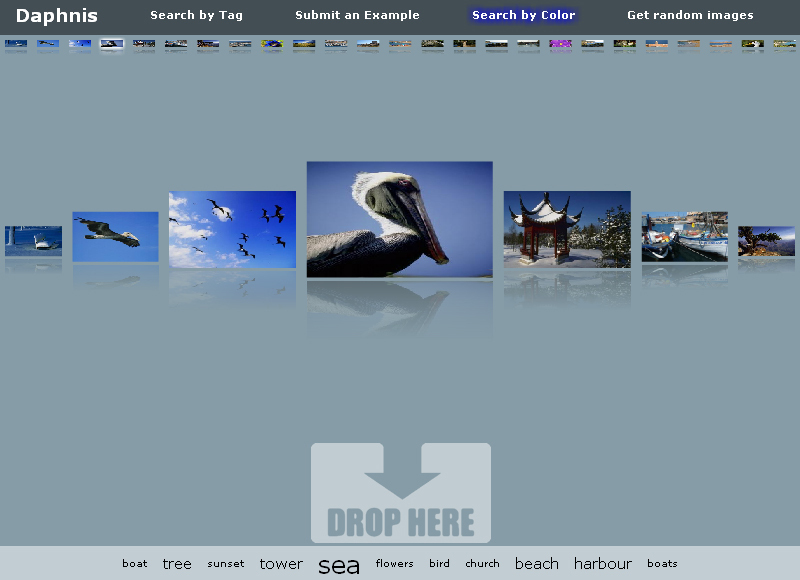 The interactive part provides two applications: a desktop-based and a web-based search engines. 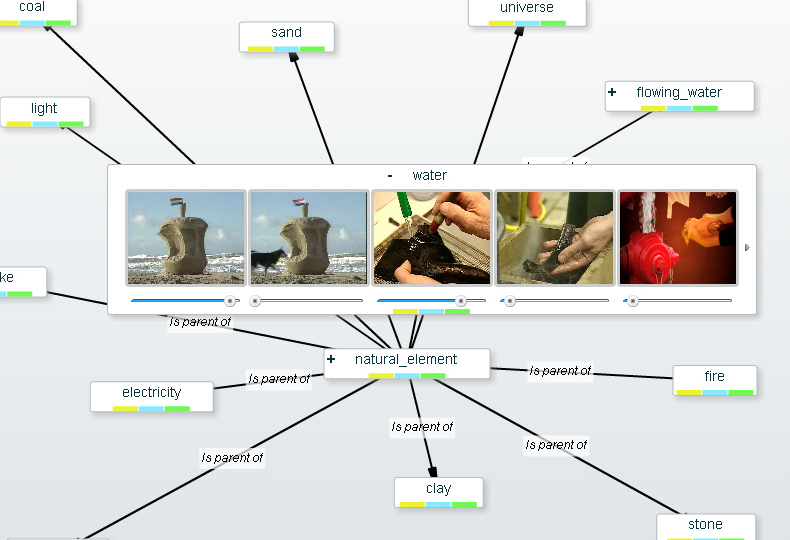 The system permits different query modalities (free text, natural language, graphical composition of concepts using boolean and temporal relations and query by visual example) and visualizations, resulting in an advanced tool for retrieval and exploration of video archives for both technical and non-technical users in different application fields. In addition the use of ontologies (instead of simple keywords) permits to exploit semantic relations between concepts through reasoning, extending the user queries. The off-line annotation part has been implemented in C++ on the Linux platform, and takes advantage of the low-cost processing power provided by GPUs on consumer graphics cards. The web-based system is based on the Rich Internet Application paradigm, using a client side Flash virtual machine. RIAs can avoid the usual slow and synchronous loop for user interactions. This allows to implement a visual querying mechanism that exhibits a look and feel approaching that of a desktop environment, with the fast response that is expected by users. The search results are in RSS 2.0 XML format, while videos are streamed using the RTMP protocol. This entry was posted in Automatic video annotation, Research projects and tagged information architecture, ontologies, RIA, semantic, user experience, video annotation, Video retrieval, VIDI-Video, web services on May 18, 2010 by admin.